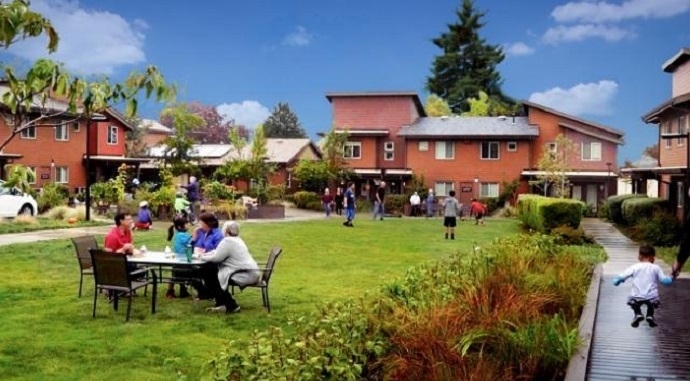 Regence BlueCross BlueShield of Oregon has partnered with Bridge Meadows, an intentional, intergenerational housing community in Portland, to help support the continued growth of its communities throughout the state. To support the growth of Bridge Meadows, Regence formed a skilled volunteerism cohort to develop a strategic plan, which will help to guide the nonprofit as it continues to scale its successful housing model. The cohort includes Regence Marketing, Communication and Brand Strategy professionals who will dedicate approximately 50 hours each over a six- to nine-month period to work alongside Bridge Meadows staff, members of the board of directors and Lawrence PR. The Bridge Meadows model is the first of its kind in Oregon and serves 70 different residents, which include youth formerly in foster care, adoptive families, and elders. The community has seen beneficial growth between the residents, and improvements in health, affordable housing and school success. Each year, Regence works with a few select nonprofits as Community Partner Organizations (CPOs). In addition to providing funding, Regence collaborates with each CPO to create thoughtful, mutual, ongoing partnerships that help forge sustainable, positive change to improve the health of our communities. Bridge Meadows is a 501(c)(3) intergenerational housing community serving youth in foster care, adoptive parents and elders (55+). Its mission is to offer permanency in the lives of foster children by providing forever homes, supporting adoptive parents with resources and giving elders purpose in their daily lives. The nonprofit has one existing location, which opened in April 2011 and can be found on the site of the former John Ball Elementary School in the Portsmouth neighborhood of North Portland. Bridge Meadows will expand to Beaverton in 2017 and has plans to open additional locations, including New Meadows, in the future. For more information, please visit: www.bridgemeadows.org.